Little did Baker know that 10 years after medical school he’d be standing in a chic SoHo boutique because of a girl named Marjorie, who he would meet in Uganda. Nor did he know that, because of her, he’d be changing thousands of lives today. This is the 18th in my series of interviews with diabetes change leaders. RG: Who is Marjorie, and what is Marjorie’s Fund? Jason Baker: Marjorie was a young woman I met two years before she died. She was 29 when she died and had many diabetes complications. She was 3 years old when she got Type 1 diabetes. I was struck by how positive she was. Even as she was dying, she was teaching others, including health care providers in her country, about diabetes. At the same time her story was awful. Yes, she survived to 29 because a wealthy Ugandan helped her get supplies and insulin, but there was never enough to prevent terrible complications. I went back and forth to Uganda many times during this period as I was teaching there. I watched Marjorie’s whole extended family struggle financially to pay for her health care. And I watched her spiral downward. I saw that even if she could get the kidney transplant she needed at the end of her life, how clinically impossible it would be to survive it in Uganda. So I helped her have a graceful death and I realized I wanted to help others avoid her fate. Marjorie’s Fund is my way to help level the playing field for people with Type 1 diabetes. To get people in underdeveloped nations enough resources and education so what happened to Marjorie doesn’t keep playing out. RG: Is Marjorie’s Fund different than other charitable organizations that get diabetes medicine and supplies to people in need? JB: Programs like Insulin for Life and Life for a Child that do that are wonderful. They help kids stay alive. But because the kids don’t have enough supplies, their blood sugars are often in the high 200s and 300s, and they get terrible complications early in life. Bringing in test strips and insulin is not really a solution. Nor is bringing in foreign aid. So we’re partnering with organizations on the ground, like those you mentioned, and looking to strengthen the infrastructure in underdeveloped areas, provide local education through local providers and peer educators, and work with pharma companies to lower the cost of supplies. We’re also building a lobbying force, which is so important to improve the standard of treatment and care. 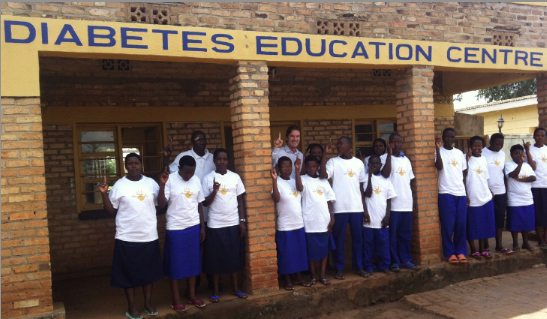 Rwanda Diabetes Education Center and its fourth class of diabetes students who learn diabetes self-management skills and a vocation, so they can afford their medicine and supplies. RG: You’re also involved in research and have a hypothesis about how we might find the cause of Type 1 diabetes. JB: When I was diagnosed with Type 1, I was in medical school and had just been to the Republic of Georgia. Since then, I’ve come to believe we’re looking at the wrong populations for the cause. We’ve been studying populations in North America, Europe and Pan Asia ad nauseum, yet we can’t find the key. We should also be studying the developing world. If we look at isolated populations in Africa and India who have Type 1, the circumstances of their diagnosis, whether there was an outbreak of something, if they’d recently traveled, and so on, and compare them with other isolated populations in a very different environment, like Scandinavia, I think we’d see some common factors. This could help us narrow our scope and hone in on the cause. RG: Why are we so drawn to help those overseas when we have people in the U.S. who don’t have access to medicine and strips? JB: When you look at the people who have no resources here, and there definitely are those who have limited resources, they still have two to three times the resources that the populations in the developing world have. 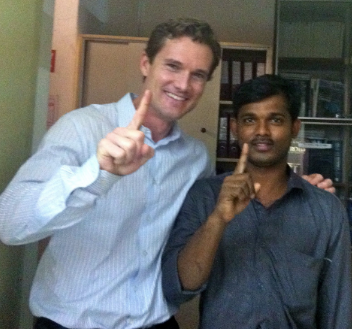 Plus, in places like Uganda or Sub Sahara, Africa and India, many providers don’t even understand the basics. Like the need to treat early and aggressively, or the power of exercise and diet as part of treatment. While I was in Ethiopia with local health care providers, I was eating the local food and testing my blood sugar every 30 minutes. The doctors asked me, “Dr. Baker, why do you check so much?” I explained the only way to see the impact of food on blood sugar is to check your sugar, and you can’t do that hours after you eat. These are intelligent people, but without ample test strips or access to continuous glucose monitors they have no opportunity to see food’s impact on blood sugar. RG: Why, in a world where we have the medicine and supplies to make Type 1 diabetes a manageable condition, is two-thirds of the world dying or getting awful complications? JB: It’s money. It’s the cost of strips. Whatever type of insulin we use, whether the more expensive analogs or less expensive regular varieties, without the ability to monitor your blood sugar, you’re shooting in the dark. Providers overseas often throw their hands up in the air. They don’t know how to manage people on insulin, particularly people with Type 1 diabetes. And without having enough strips, they can’t work out how their own culture and diet affect blood sugar. RG: Does the work you’re doing today surprise you? JB: I was raised by parents who emphasized the glass is half full and to use whatever situation you’re faced with to become stronger and learn from it. I guess that’s what I’m doing. I feel having Type 1 diabetes has actually enriched my life and opened more doors than it could ever possibly close. I do think managing Type 1 diabetes is difficult, and I wouldn’t wish it on anyone, but it gives me a sense of purpose and clarity about what I’m meant to be doing. When I was diagnosed it woke me up to what’s important in life, like relationships and helping others. Looking back, I don’t think I’d change anything. I also think we can’t live in our own little bubble. We have to help each other. That’s kind of been the cannon of my life and that’s what Marjorie’s Fund is about. RG: How is Marjorie’s Fund funded and how can others help? JB: We’re funded by private donors and my own pocket. We just got our 501 status earlier this year, so we’ll be ramping up our outreach, searching for donors, and seeking grants to take our work to the next level. We certainly need financial assistance. And we need people to help spread the word so all of us out here doing this kind of work can better align our efforts. And, so that people understand Type 1 diabetes better, care more and do something. Lobbying support is as important as financial support. True change will happen when people get involved and raise their voice. That’s what my friend Marjorie was doing when she died. Thanks for sharing this story; it really is fascinating and also great to see initiatives such as Majorie’s Fund taking initiatives like this.